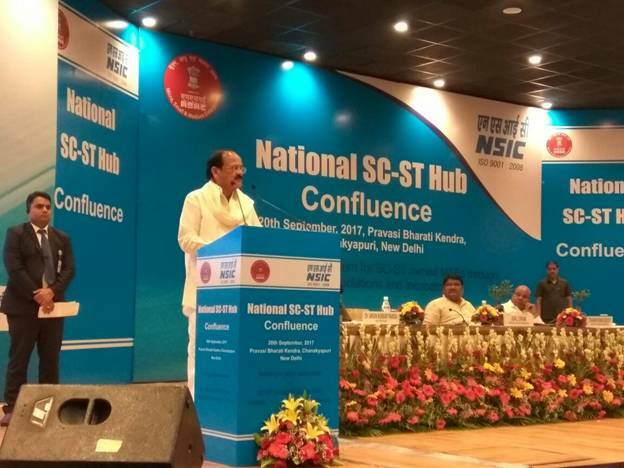 New Delhi: The Vice President, Shri Venkaiah Naidu was the Chief Guest of National SC ST Hub (NSSH) Confluence organized by Ministry of Micro, Small and Medium Enterprises (MSME) and also released first ever radio jingle for National SC ST Hub. Minister of Social Justice & Empowerment Shri Thaawarchand Gehlot, Minister of Tribal Affairs Shri Jual Oram, Minister of State (Independent Charge), Ministry of Micro, Small and Medium Enterprises Shri Giriraj Singh, Minister of State, Ministry of Finance Shri Shiv Pratap Shukla, were also present to grace the occasion. The Vice President of India, Shri M. Venkaiah Naidu has said that a collective, coordinated action is needed to strengthen the eco-system for promoting SC & ST Entrepreneurs in the country. He was addressing the National SC-ST Hub Confluence organized by the Union Ministry of Micro, Small & Medium Enterprises, here today. The Union Minister for Social Justice and Empowerment, Shri Thaawar Chand Gehlot, the Union Minister for Tribal Affairs, Shri Jual Oram, the Minister of State for Micro, Small & Medium Enterprises (I/C), Shri Giriraj Singh, the Minister of State for Finance, Shri Shiv Pratap Shukla and other dignitaries were present on the occasion. The Vice President said that the country will be developed when the downtrodden and under-privileged sections are uplifted. He further said that we need to have an integrated, multi-dimensional developmental agenda for the development of the country. The Vice President said that setting up of Industries is important for the development of our country and it will solve the unemployment problem and increase the income. He further said that industry and agriculture are two important factors for the overall development of the country. The Vice President while referring to the national discourse today, Stand-up, Start-up, Incubation, Innovation said that this should get further momentum and tempo. He further said that Make in India, Skill India, Digital India, Clean India – all these programmes should reach every section and everybody must get their due. Capacity building is important; credit availability is important, technology up-gradation is also important, he added. The Vice President said that the Micro, Small and Medium Enterprise Sector (MSME) is the bulwark of the Indian economy and one of the largest employers after agriculture. He further said that it is also one of the major contributors to the country’s GDP. With Make in India envisaging to push contribution of the manufacturing sector to 25 per cent of the GDP by 2022, the MSME sector will be required to play a critical role in achieving the goal, he added. The Vice President said that skill up gradation is one area that requires top attention for the overall development of SC/ST entrepreneurs. He congratulated the National SC/ST Hub for signing MoUs with Sector Skill Councils to skill over 2,000 entrepreneurs and said that the associations and incubators have a huge role to play in supporting the objectives of National SC/ST Hub. Each association must extend support in building capacities and mentoring entrepreneurs in its respective sector, he added. Shri Shiv Pratap Shukla, Minister of State for Ministry of Finance, mentioned that Sabka Saath, Sabka Vikas is the genesis of the idea of inclusivity. He also promised his Ministry’s full support to the Ministry of MSME to enable entrepreneurism amongst the SC ST community. Shri Jual Oram, Minister of Tribal Affairs stated that he was glad that the Government has taken an initiative as unique as NSSH to uplift the ST community of the country. Shri Thaawarchand Gehlot, Minister of Social Justice & Empowerment mentioned that all MSMEs face challenges in marketing their products due to competition from large enterprises which is why the Public Procurement Policy is a welcome step. Shri. Giriraj Singh, Minister of State (Independent Charge), Ministry of MSME thanked everyone for their presence and mentioned that if SC ST entrepreneurs can get orders worth Rs. 5,000 crores, it will go a long way in helping such entrepreneurs. He mentioned that the day the job seeker becomes a job giver, dreams of everyone shall be accomplished. Dr. Arun Kumar Panda, Secretary, Ministry of MSME highlighted that the programme was a medium to build bridges therefore connecting everyone and bringing everyone on a common platform. A brief presentation was given by Joint Secretary, SME, on the initiatives undertaken by the hub, highlighting the progress till date. The confluence brought various insights from Industry Association and Incubators to understand the gaps in realizing the mandate of Public Procurement Policy and put forth innovative strategies for holistic development of MSEs owned by SC/ST Entrepreneurs. The discussion held was extremely fruitful and intend to go a long way in meeting the objectives of the National SC ST Hub. Interactive session was held with over 150 industry associations and incubators with representation of over 400 participants, focussing on collaboration with NSSH, to augment the capabilities of existing SC/ST entrepreneurs. Several excellent suggestions were made with respect to market access; capacity building, tender challenges, technology upgradation, etc. were made. The session also focused on future action plan along with role to be played by each stakeholder to achieve the objectives of the hub. In addition, MOUs were signed with 3 Sector Skill Councils to provide skill development trainings of SC-ST Entrepreneurs under capacity building initiatives of NSSH. The Government of India formulated the Public Procurement Policy, 2012 which states that 20% of total procurement of goods and services by Central Ministries, Departments and CPSEs shall be made from MSEs and 20% of such procurement (4% of total) shall be from SC & ST owned MSEs. NSSH is a unique initiative launched by Prime Minister Shri Narendra Modi on 18th October 2016. This initiative is aimed empowering SC ST owned MSEs in order to achieve the 4% mandate of the Public Procurement Policy. In view of the above, the NSSH initiative has the potential to work on ground and have an impact till the last mile. Due to the social and economic bearing the programme can have, it requires a strategy that delivers sustained and measureable impact, on the entire MSME ecosystem. Therefore, there have been continual efforts to include all relevant stakeholders including state, industry associations, incubators, CPSEs to identify synergies and work collaboratively and cohesively towards a shared goal. 9. Training programme conducted in IIM Noida (Satellite institute of IIM Lucknow), IIM Lucknow, IIM Raipur, IIM Kolkata and XLRI Jamshedpur (on pilot basis) for SC/ST entrepreneurs for over 100 SC/ST entrepreneurs. 1. Getting support from Industry Associations on data consolidation and Udyog Aadhaar Memorandum (UAM) registration. 2. Providing on ground support to adopted SC-ST owned MSEs by Industry Associations and Incubators. 3. Assisting NSSH in future endeavours in spreading awareness by participating, organizing various events, seminars, workshops, knowledge sessions etc. 4. Mentoring and handholding support to potential SC-ST entrepreneurs during and post incubation programme. 5. Providing capacity building trainings to SC-ST Entrepreneurs. 1. While releasing tenders, CPSEs should focus on quality based products manufactured by MSMEs, especially SC-ST entrepreneurs rather than established brands. 3. It was suggested that the prequalification criteria for CPSE tenders should be eliminated for SC ST MSEs. 4. For VDP programmes, it was suggested that instead of conducting the VDPs in neutral locations, these should be done at the premises of the respective CPSEs. 5. It was proposed, that sanctioned loan tenure should be extended to provide sustainable support to SC ST MSEs.